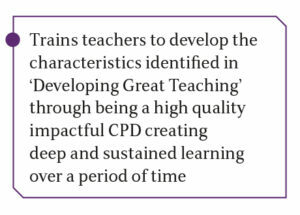 The Teacher Effectiveness Enhancement Programme (TEEP) is a whole school framework and training model with learning, collaboration, and evidence of what works at its core. Over 450 schools and 14,500 teachers have engaged with TEEP through SSAT since September 2010. The programme is aimed at teachers across all levels of their careers and at all academic levels, with the aim being to inspire every teacher towards delivering a consistent level of high quality teaching. • TEEP has a beneficial impact on teacher motivation and morale. • Staff become more focused on the actual learning taking place in the classroom and value the feeling that there is a much stronger sense of community amongst peers. Click here to find out more about TEEP.